Launched in March last year, IAN’s Small Ticket Funding programme helps startups meet their immediate funding requirements. As part of the programme, IAN offers a fixed investment of Rs 25 lakh (around $36,459) at a fixed valuation of Rs 2.5 crore after investment. “The app helps consumers make better choices for themselves instantly. The market for fashion apps is huge and with the advancement in technology, it’s only going to grow. This concept is unique and fulfills human desire to make an informed decision,” said Gupta. Founded in January 2014 by Meghna Saroagi, Styledotme is a fashion app that helps users make quick and instant fashion decisions through their networking of friends and followers along with expert advice. The app allows to instantly poll friends and followers and get them to vote on user’s choices. Besides, the app also provides for instant expert advice to the users. 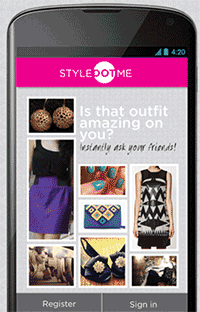 An app-only platform, Styledotme is available on both Android and iOS. “While there are many apps that let people share their style and get opinions and comments, Styledotme is unique in focusing on the fact that people often need urgent advice when making fashion choices,” said Meghna Saroagi, founder of Styledotme.